You can use online or download from Google Play Store. Your Own Website. Hassle Free! Sorry No Initial Phone Support. We may call you if needed. Video Help Tutorials Make Your Shopping Easier! Choose PayPal Checkout in the Shopping Cart. It’s Safe. It’s Free. It’s Smart! Works as a Heater or a Fan. 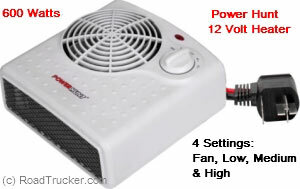 Best 12 Volt Heater available anywhere, as far as power and heaters that work by warming the air. Save on fuel, reduce pollution, and still stay warm & comfortable while almost 170 degrees of heat keeps your bunk area or camper warm and cozy without running your engine. Automatic low voltage alarm lets you rest without worrying about running your battery down. 4 settings. Why is RoadTrucker advertising this as a 600 Watt heater, instead of a 700 Watt heater, as the manufacturer indicates? The reason is simple. It draws 50 amps at 12 volts and that calculates (50 x 12) to 600 watts, not 700. So how does the manufacturer get 700 watts? Are they wrong? Well.. Yes and No. It depends on the application. When the heater is connected to a standing battery, they are wrong (12 x 50 = 600). But if the heater is being used in a running vehicle, they are right. The operating voltage of a running engine is usually around 14 volts. 14 volts x 50 Amps = 700 Watts. 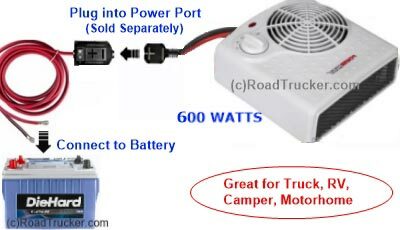 RoadTrucker feels that, this heater is advertised as a 12 volt heater and that means that it can be used with a standing battery, which does not produce 14 volts. Hence, we advertise 600 watts and not the 700 watts that Power Hunt and everyone else advertises. NOTE: When you add your Power Hunt 12 Volt 600 Watt Heater to the cart, we will also add a 12 Volt Power Port that hooks to the battery via 8' of wire with 2 connecting rings on the end. If you already have one, then click on "remove" in the cart to remove it before completing your purchase. First time Purchase of a Power Hunt Appliance will need the Power Port. How Long Will My Battery Last?Will the Heater Work in my Application? Automatic shut off system to prevent overheating. Great for helping to keep truck warm or defrosting windshields. Do Not Send Returns Here. Returns must be documented via Email.